CELEBRATING MY BIRTHDAY AT HARRY POTTER STUDIOS IN LONDON! 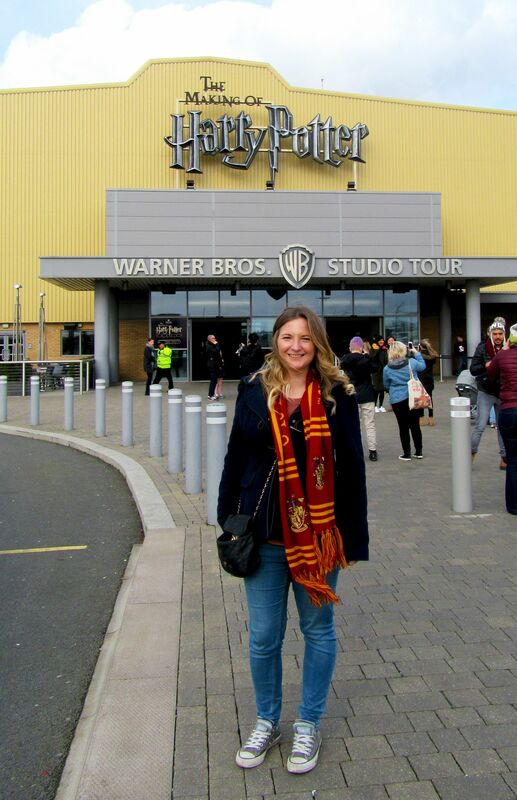 For my birthday this year, I went to Warner Brother Studios in London to see the Harry Potter set! If your not aware, I am a MASSIVE Harry Potter fan! I’ve read all the books (which is a massive accomplishment for someone who is dyslexic), and all the films at least 20 times each! I’ve also been to both Harry Potter Worlds in America and I’ve never been able to go to the Studios here in London where I actually live! 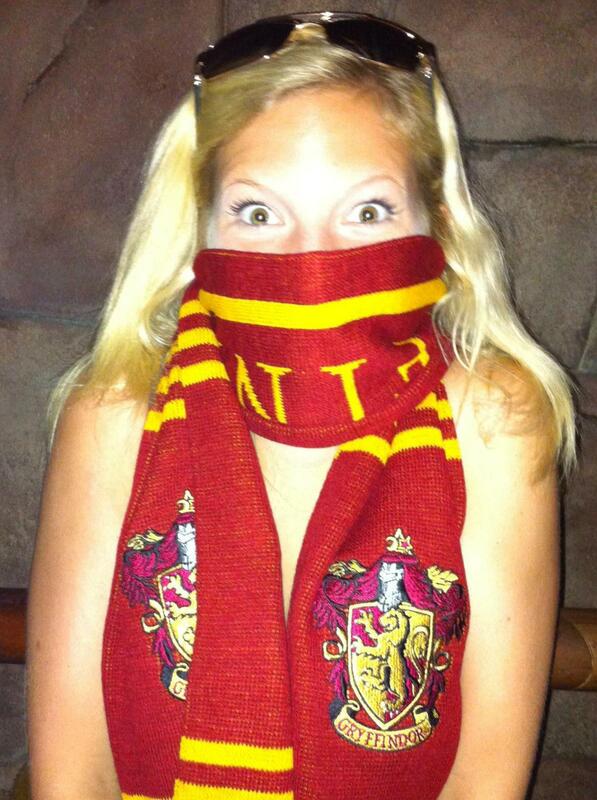 Here’s how I spent this magical day at Hogwarts! I live in London so it was just a short train ride to Watford Junction. Once you get there you need change for the bus so make sure you have some or you’ll be queuing up just to run back into the station. To my disappointment it wasn’t the purple night bus the picked us up. Just wishful thinking on my part! The buses are right outside the station…you cant miss them! They’re all pimped out with Harry Potter logos and even though its not the night bus it was still exciting. On the bus there are TV screen explaining what to do when you get there. Make sure you listen to these as I think we would have just ran for the front doors! A short bus ride later we were at Warner Bros Studios! I can’t explain how excited I was to see the front door! It took FOREVER to pick up our tickets! Here’s a little tip…don’t use the computers to pick up your tickets. There were a lot of foreign travelers who were struggling to work the computers which were set in English. Even though there was a nice lady there to help people, it still took a very long time and the line for the pick up from the WB staff in the windows was a lot quicker. Once we were finally inside the building after much anticipation, we had to line up to start the tour. The entrance was just as exciting, with posters of the actors from the movie surrounding the room. The flying car was handing about us and even the toilets had this hilarious sign on them. While we were lining us we got to see were it all started….the real cupboard under the stairs! Poor little Harry! Then is was on with the tour! It starts with a round up of how the Book became films and how it became a world wide phenomenon! We even go into a massive theatre and watch a short round up. Quite frankly I could have watched all the films back to back right then but I waited till I got home! We then headed to the doors to the Great hall. This is were I felt like it was all actually happening. The staff then asked if it was anyone’s birthday…. MEEEEEEEE! No shame! As a birthday treat I got to open the doors to the great hall! What an honour! We spent some time in the great hall checking out all the amazing details that went towards making my favourite films and then it was onto another area of the tour. This had all the costumes from the films, props and some of the scenes from the films like the entrance to the chamber of secrets and the Gyrffindor common room. I was in Harry Potter heaven! Prepare for a lot of photos…I got very snap happy at this point! In this room there is a green screen area where you can ride a broom stick! Yes, all your dreams of being in the Quidditch team are about to come true. I was all for it, whereas this isn’t something my sister is keen on. I don’t care if I look silly at all so I was all game! Bring it on! You can even get a video of you flying on the broom stick through London and ending up in Hogwarts. Or there is an option to get a photo so I took this option as I couldn’t afford both. 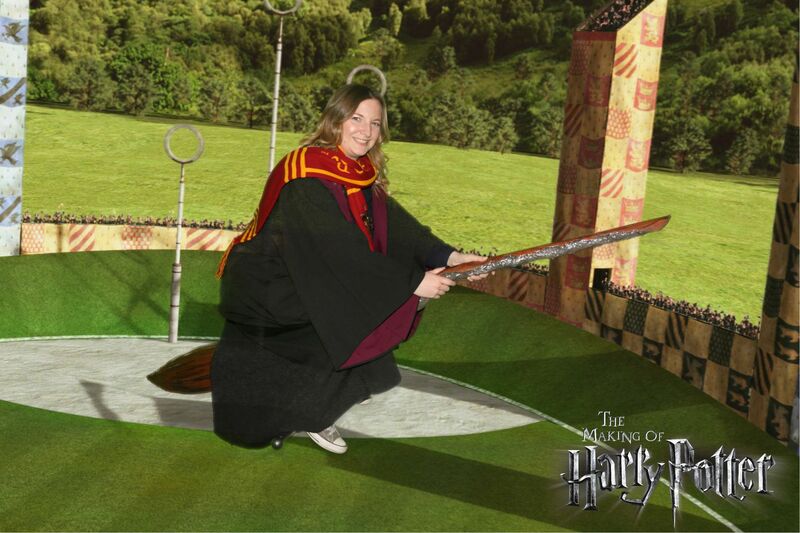 Here it is….me on the Gryffindor Quidditch team! Jealous? Next stop, it’s Hogwarts express! I’ve wanted to be on this train for years! It was truly magical and I even got a picture with the trolley going into the wall at Platform 9 3/4! You can even go on the train and and see all the different compartments which were used for each film as the characters grew up. The last segment you can go into another green screen room on the train and act as things appear out of the window. We even had dementors outside the window like from the scene in Prisoner of Azkaban. We had to act scared….nailed it! Unlike my sister, Nicole who was more entertained by my acting skills! We were half way through the tour so it was time to have some food and yes, some BUTTERBEER!! So I’ve been to both Harry Potter Worlds in America but I haven’t had any butterbeer! I know! The lines were always too long but I now had my chance! Honestly, it wasn’t as great as I thought it would be so I was a bit disappointed. It was really fizzy? My sister had recently been to Harry Potter World in Orlando and she said it tasted a bit odd too. Usually it’s not that fizzy. Maybe it was a bad batch? I got to keep the mug and still use it in work but for water…not butterbeer sadly. The next part of the tour is outside where we got to see the night bus and the Harry home on Private Drive! There’s really not much to see inside the house but it does have an excellent display of the letters for Harry. I was more fascinated by the bus which was very hard to get a photo with but I am persistent to say the least. We got to walk the bridge to Hogwarts and get in the flying car (currently ground level!). There’s even a room filled with all the CGI, animatronics and masks etc used to make all the magical creatures. We saw the magestic Buckbeak, dobby and the masks of the goblins. They even has a display so you could make them move. While I was there they had a station where you could make Dobby move when you move. So cool! I love Dobby! Who doesn’t? I find this stuff really amazing as I did a degree in TV Production Management and I’ve always wanted to make a film or TV show. Maybe one day! Onward to Diagon Alley to pick up a wand and find my owl pet! This street is incredible! All the different shops which Harry and the gang use to go shopping on before school started. The Wesley twins joke shop after they flunked out of school. Sadly no Gringots bank but I think Harry Potter World out does this now with the fire breathing dragon display. It’s the grand finale! HOGWARTS!!! Thank you to my sister Nicole for an amazing birthday present. I had such an incredible day and have enough chocolate frogs to keep me going to my next visit! Which might have to be soon because we just missed out on the Forbidden Forest opening date but I can’t exactly change the date of my birthday. I’ll need to go back very soon! What an amazing experience. Now, onto a Harry Potter DVD marathon! Have you been to Harry Potter Studios? Which part did you enjoy the most? If you’ve not been yet which is your favourite Harry Potter movie? Previous Post 6 Films you must see this April!